Lyla was adopted by the Farina family in November of 1997. A shy and timid dog, she has blossomed into a loving family member. People who meet Lyla comment on her calm behavior and her “smile”, but she is also a very playful dog. 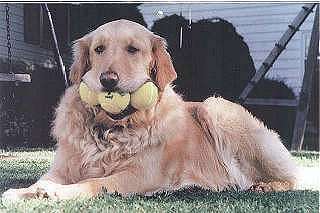 She takes her tennis balls everywhere and the only way to keep them all together is in her mouth. She runs, sleeps and barks with them stuffed in her mouth and brings much laughter and joy to the Farina household.